See also my 2006 tour to Cambodia and Thailand. From Chiang Mai I took a plane to Ko Phuket because the train would have taken too long. Thai Air is efficient and punctual. I expected rickety turboprops but they fly Airbus widebodies. I only wished they wouldn't play Strauss muzak on the plane. Ko Phuket is the largest of the islands of southern Thailand, and the one with the most tourist beaches dominated by highrise hotels. Most are on the west side. I chose the Marina Cottage resort, which has a number of small luxury huts in a tropical park directly on a rocky part of the beach. I went for the most expensive room class ($84 off-season); the picture shows the view from my private terrace. Not bad at all. Ko Phuket is the largest island, but it is actually rather boring. They have little towns catering to tourists, full of agencies selling diving trips. Diving is the big thing there; everybody offers boat trips to small islands with interesting coral reefs. However, diving requires a license, and getting one takes about four days and isn't cheap, and I wasn't planning on staying that long. It is a wonderful place to relax though. I tried to rent a bicycle but I did not find an acceptable one. Here I also had a Thai massage. It was not entirely unpleasant. That lady had surprisingly strong hands and could make bones pop that I didn't know I had, when she wasn't busy walking on my back. 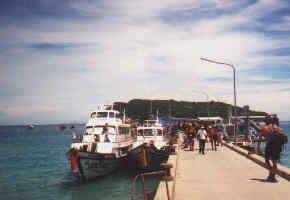 From Ko Phuket I took a ferry to Ko Phi Phi. The Lonely Planet guide says that Ko Phi Phi is sadly overdeveloped and this is true. Good for snorkeling they say but otherwise skippable. Ko Phi Phi is actually one larger and one smaller islands connected by a narrow bridge, and it only takes a few minutes to walk from the beach on one side of the beach to the one on the other side. There are lots of tourist trap shops here, construction and garbage dumps. 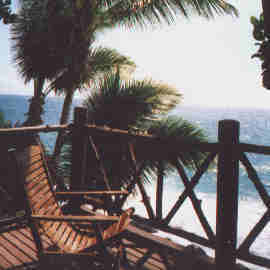 Getting away from all this is difficult because there are few paths to the interiors of the islands. Probably a good thing. The next stop was Krabi, a port town on the east side of Phuket bay. Krabi is boring, and the Riverside Hotel, supposedly the best in town, is overrated. Pillows like bricks and no hot water in the morning. I decided to skip the rest of Phuket bay, including the ``James Bond island'' where the showdown in one of the James Bond was filmed. Local maps actually say ``James Bond island'' in Latin characters, and travel agencies sell boat trips there. All this is way too commercial for my taste. The picture on the left shows a larger than average food vendor cart. 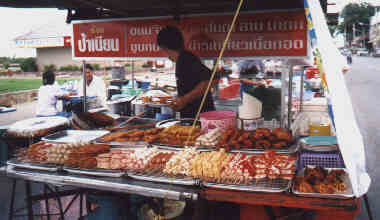 It consists of a gas stove and plates with all kinds of seafood and Thai sausages on sticks, which are fried on order. The variety of seafood is enormous, everything from fish to giant shrimp to Calamari, which are pierced through the head with limp tentacles hanging off the end of the stick. Delicious. A bus brought me from Krabi to Surat Thani on the eastern shore of southern Thailand. It's another port town, but unlike Krabi buzzing with activity and markets everywhere. 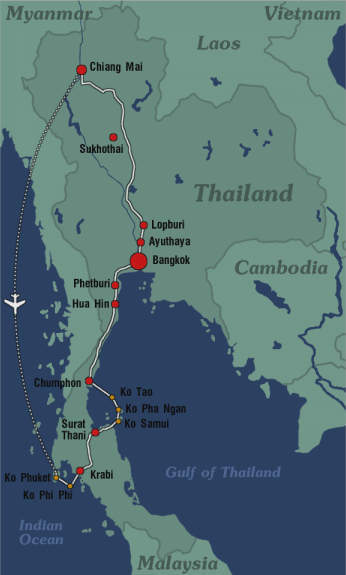 I didn't stay overnight but bought a combination bus/ferry ticket to Ko Samui, my next destination. I had some time left and rented a long-tail boat to tour the houses built on stakes on the other side of the wide river through Surat Thani. A long-tail boat is a long and narrow wooden boat, with a large truck motor mounted on a pole in the back. The motor drives a long axle (hence the name) with a propeller at the end, which is lowered into the water. The motor has no housing, the transmission belt and cogs are all open. It makes a lot of noise but achieves remarkable acceleration and speed, throwing up a lot of muddy brown water. The picture on the right shows a long-tail boat in action, with some of the wooden houses in the background. The bus tour to the ferry station closest to Ko Samui was again an opportunity to watch traffic in Thailand. Since there are a lot of vehicles with very different speeds on the road, there is a lot of passing. Passing is announced by a short honk (so everybody honks all the time), and although the roads are very well built they are not especially wide so people pass closely. Oncoming traffic, or the inability to see oncoming traffic because of a hilltop does not keep anybody from driving on the wrong side of the road to pass, causing oncoming traffic to honk too. It's even worse than in Potsdam (because there are no hills in Potsdam). How they manage to survive this driving style is beyond me. Practice, I guess. Ko Samui is a bit like Ko Phuket, only not as developed. The luxury resorts are missing, and rooms are cheap and simple. The island does make up for it by providing picture-perfect beaches and palm forests. The picture on the left shows the entrance to the hotel park with the huts to both sides, seen from the hotel beach. 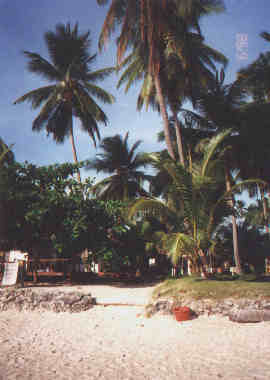 Ko Tao is largely undeveloped. Undeveloped doesn't mean pristine beaches but construction and wild garbage dumps because the lack of development obviously cannot be tolerated. Power failures happen here. Not really recommended except as a base for diving. I went to the supposedly nicest hotel, Ko Tao Cottages. The room was nice enough but the beach was filthy, there was construction, the showers were cold, and the outdoor restaurant was so poorly lit that the waiter brought a flashlight. The food was good though, and I discovered fresh coconut milkshakes. I took the speed boat from Ko Tao to Chumphon, a distance of about 80 km. A speedboat is a small boat with two large outboard motors, much smaller than the boats in the picture below (the boat hadn't arrived yet). Once clear of the island, the waves got higher and the boat started to bounce off the waves - a splash, the motors go idle, a moment of weightlessness and then the crash into the water. What started out fun got worse. The sea turned dark gray, deck plates shook loose, and the left motor started to be thrown up in its gimbal mount. The pilot and copilot stopped and fixed it with some rope while the boat was bobbing on the waves. Some time after that both motors made funny noises - more inspections, and we were now asked to wear life jackets. The waves were now so high that if one of us went overboard it would be impossible to see him more than ten meters away. Meanwhile, the pilot was conferring with someone on the radio (we had radio - good). I don't speak Thai, it could have been an SOS or an advice that they'd be late for lunch. We went on at lower speed for hours, with several more motor problems. When we finally reached Chumphon, after twice the normal travel time, the sea went green and quiet and the sun comes out. As I sit here safely on the pier, I decide to take a good look at the boat that will take me to the Caribbean next month. From Chumphon I took a minivan to Hua Hin. There is something exciting about saying "one-way to Hua Hin, please" to a Thai ticket agent that Berlin's public transport system just can't match. After a few hours on the road, including a rest stop, we got to Hua Hin. All of Thailand is clean in the sense that it is cleaned constantly, but Hua Hin is clean in the Western sense - it all looks sparkling new, to appeal to tourists. It's in fact one giant tourist trap. This also means almost impeccable rooms at the Ban Boosarin hotel for very reasonable 800B, a welcome change after the island hotels. 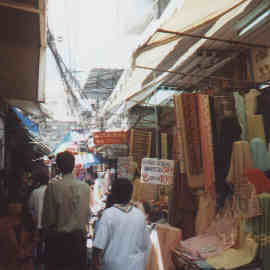 They have a rather nice bazaar in the north-eastern part of town, well away from the tourist hotels. My last stop on the way back to Bangkok was Phetchaburi, another town with a long history. It has a nice circuit of well-preserved wats but it lacks the charm of towns like Lopburi. It's basically a busy commercial town that happens to have a string of temples around the edge. The best hotel is a very noisy dump at the edge of town. I used a motorcycle cab to the bus terminal; I would never have found it by myself. Bangkok is very different from the rest of Thailand. It has a population of six million and a totally dysfunctional transportation system, which they are trying to fix by building raised freeways. As if that had helped any anywhere it was tried... During Bangkok's extensive rush hours, car exhaust forms a swirling smog in the main streets, and the noise is deafening. There is lots of construction, but the noise of the jackhammers is drowned out by the traffic. Crossing a street becomes a matter of courage, timing, and good judgment of the potential homicidal tendencies of the drivers. Unless everyone is hopelessly tangled again and nothing moves. Policemen wear smog masks here. The easiest way to move here is one of the water taxis on the Chao Phraya river. They cost almost nothing and are very efficient, always either running full throttle forward or full thottle backward to slam against the ponton stations to let people on or off. I stayed at the Oriental Hotel, considered one of the best, or the best hotel in the world, which has its own water taxi station. The Oriental is impressive. They average three employees per guest and right after I checked in they all seemed to know my name. Everyone is smiling, bowing, rushing to open doors, making up my room whenever I wasn't looking, and are generally helpful with everything. Finally, a hotel with noiseless air conditioning. 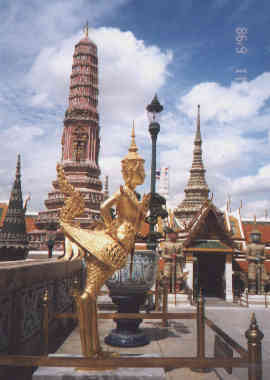 They actually have a dress code, but then so does the Grand Palace, some water taxi stations up the river. The latter is overwhelming in its gold and mirror mosaic splendor. (So are the touts outside, preying on tourists like vultures.) The palace and the adjoining Wat Pho are huge, full of temples, shrines, buddhas from finger-sized to 46x15 meters, and tourists and their desperately beeping cameras that know that their flashes don't have a chance in front of the 46-meter buddha. No matter where one turns, there is another group of palaces and chedis, covered in gold and mirror mosaics. 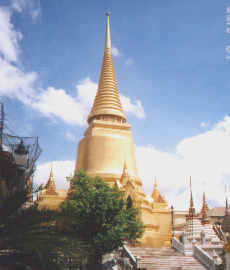 The picture to the left shows the central chedi, covered entirely with gold. It is possible to enter some of the temples, but only after taking one's shoes off. They have long rows of racks to store them. Taking pictures inside is not allowed. There is a row of over three hundred golden buddhas, hundreds of meters of wall paintings, statues and gates and stone temple guards and chedis. In another temple eslewhere they have a three-meter Buddha made of pure gold, weighing 5.5 tons. When I couldn't stand it any longer, I left the temples, fought my way through the ubiquitous touts trying to sell cab rides, gems, girls, or custom-made suits, and wandered all over the city's markets. It is actually possible to see Bangkok by walking; the interesting part of downtown area is not large, only a few square kilometers. Of course, not all of Bangkok consists of golden temples. They have deceptively scenic canals, called Klongs, that are said to be so polluted that nobody who falls in gets out. There is a modern part of town near the university that contains some shopping centers but is not worth visiting. There is construction everywhere, mostly those raised freeways but also new office buildings. 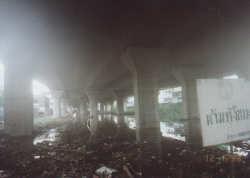 The picture on the left shows this other side of Bangkok. Walking by a Thai dumpster is a truly stunning experience. Guess what happens to garbage, especially meat, real quick in hot and humid weather. Check out Martin Schmidt's homepage for some stunning pictures of Thailand and neighboring countries. What should one bring to Thailand? Very little. Light and thin cotton clothes; shorts and short sleeves mostly but at least one set of long pants and long sleeves, for visiting the Grand Palace and to expose less skin to Malaria-carrying mosquitos in the north at night (I am told they only come out when it is dark). Doing laundry is not a problem in towns and good hotels, for very reasonable prices. I recommend bringing stomach medication even though I didn't need it. A compass, sunglasses, heavy-duty sunscreen, light raingear, and a Swiss army knife are important. The Lonely Planet Thailand guide is essential (ISBN 0-86442-411-6); everybody traveling there has one and its hotel, restaurant, and sightseeing advice is indispensable. The admission price quotes, however, are not. All wall outlets I have seen accept both Euro and US plugs, at 220 volts. You will need plenty of earplugs; traffic, especially trains, can be incredibly loud. In most hotels with air-conditioning I stayed in the air conditioner was necessary but so loud that I couldn't sleep without earplugs. Bring traveller's cheques in large denominations such as $100 and $50, and a Mastercard or Visa credit card if you plan to stay in high-end hotels. I had a hidden waist pouch because theft is said to be a problem. By avoiding expensive tourist places $100 goes a very long way in Thailand, one can comfortably live on $100 (B4200) per week. I was there in early June, in the rainy season. The monsoon had the decency to delay its arrival until after I left, which means hot and sunny weather, but this is unusual. The advantage of the off season (Mai through July, longer in many areas) is that it is possible to just walk into any hotel or resort and always get a room, and for a discount too. Above all, pack light, certainly not more than 10 kg.